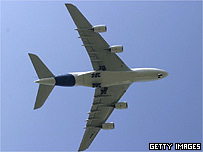 Airbus has confirmed that deliveries of its forthcoming A380 super-jumbo will be delayed by six months. Its confirmation came after Australian airline Qantas said the delivery of the first of its 12 A380s had been put back from October 2006 to April 2007. Singapore Airlines, which is set to be the first carrier to fly A380s, has already warned of possible delays. Airbus could now face compensation claims from the carriers. It said there was no specific reason for the delays. "There are a variety of things," an Airbus spokesman told BBC News. "In most airline programmes of this size - including those of our competitors - things can run a little later than originally planned. "The plane is continuing to perform well in tests." Qantas chief executive Geoff Dixon said the delay was "disappointing, given that we have met all of Airbus' deadlines for Qantas specifications". He said Qantas would now be seeking compensation from Airbus, under the terms of its contract. The announcement of the delays - which will affect all airlines who have ordered the A380 - comes five weeks after the plane's maiden flight on 27 April. Singapore Airlines was the first to reveal its order had been put back, by at least three months because of delays in testing. The carrier has ordered 10 of the planes with an option for another 15. 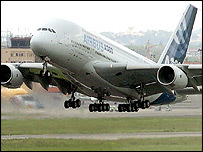 However, it does still intend to carry out the first flight of the A380 with passengers at the end of 2006. The Airbus spokesman added that all airlines affected had been told of the delay. "We have spoken to our customers and kept them informed of the situation," he said. Max Kingsley-Jones, commercial aviation editor at aerospace magazine Flight International, said it was almost inevitable that there would be some delays in a project of this size. "It is not clear yet where exactly the delays have manifested, but in a project of this size some delays were to be expected." The A380 has cost Airbus 12bn euros ($14bn; £8bn) to develop, and will be the world's largest airliner, seating more than 800 passengers across twin decks. Airbus is betting it will represent the future of air travel, meeting the demand of the airlines for a new bigger plane to fly between the main international hubs. 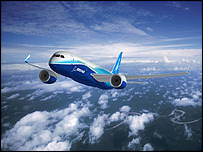 Boeing, Airbus' great US rival, backs a contrasting vision of fuel-efficient mid-sized planes which can better service smaller airports - such as its 787 Dreamliner, which is in development. Airbus is 80% owned by European aerospace and defence group EADS, and 20% by the UK's BAE Systems. Shares in EADS were down 1.2% by early afternoon trading in Paris, Wednesday's biggest faller on France's main stock index, the Cac 40.